Our excellent Canadian test pilot said the all new Elantra Sport sedan is a pretty damn good car with a helping of fun, especially for its price point. Well, if you wanted the same goodness but with a more practical body, Hyundai will now offer the Elantra GT hatchback. Due to arrive in showrooms soon, the Elantra GT will do battle with the Mazda3, VW Golf, Honda Civic, and similar small hatches. What it is not, is a bargain GTI or Focus ST fighter. This is a commuter car with an injection of sportiness, packed full of features, for an incredibly reasonable price. Hyundai says the Elantra GT has more cargo room that all of its five-door competitors, which doesn’t sound all that exciting, but those extra cubic feet matter especially if you need to toss a stroller or some gear in the back. The Elantra GT will start $20,235 (including destination) for a base car with a 160 horsepower 2.0 liter and a six-speed manual transmission, add an extra grand if you wanted a six-speed auto. Standard features will include 17 inch wheels, an 8-inch infotainment unit with Apple CarPlay/Android Auto, and a cool remote start feature via Amazon Alexa/Hyundai BlueLink will be available. The car you want is the Elantra GT Sport that comes with the same 201 HP, 1.6-liter turbocharged motor and six-speed manual from the Elantra Sport sedan. The GT Sport will start at $24,125 (including destination), a dual-clutch automatic will cost another $1000. The Sport gets the requisite 18-inch alloys wrapped in high-performance all-season tires, in addition to larger brakes, and swaps out the regular GT’s suspension for a rear multilink setup that Hyundai says gives the GT Sport more dynamic handling. The GT Sport will also be available with the usual array of advanced safety features such as automatic braking, blind spot warning, and collision mitigation. 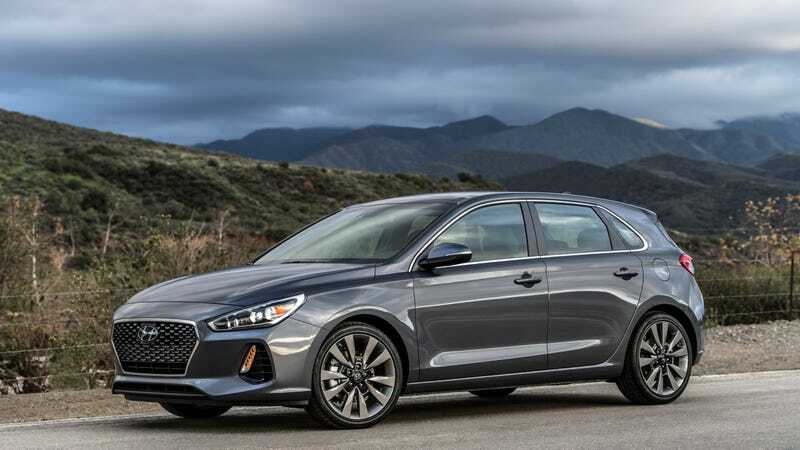 Hyundai has come along way from being just a “value brand” but the Elantra GT still packs a ton of features and fun, in addition to a long warranty in a compelling package.